Hey guys! Time for another installment of Ask Sentai, yes! We hope these blogs have been informative in one way or another, and please remember that sometimes there are questions we aren't allowed to answer or can't quite answer yet. So if you're asking about something that falls into those categories, I'm afraid we wont be able to answer, sorry! As always, if you have a burning question, you can head to our ask.fm profile and let us know. Thanks! When will we find out the English dub cast for Hamatora? Hey Sentai Filmworks, since you putting out show like Akame Ga Kill on toonami can we possibility see more shows coming in the near future like maybe old show or maybe action show. Example, DanMachi, GATE, or Ushio and Tora. The next Sentai show to make its way to Toonami will be Parasyte -the maxim-, which we are all really excited about, we hope you guys are too! Beyond that, we're not sure, but it wouldn't hurt if you watched both Akame and Parasyte every week with us. I assume this is a very silly question but I am curious if there's ever been a situation where someone catches you watching anime that hasn't been licensed or acquired by Sentai Filmworks around the office. Is that a big deal, or are you guys just free to watch whatever anime whenever? We all like anime here. While I'm typing this the girl behind me is watching Umaru-chan, I just had a nice chat with the guy who is subtitling one of our Summer shows, and I have the new episode of SCHOOL-LIVE paused and ready to go for when I finish up Ask Sentai. Can you give you any information about the Gekkan Shoujo Nozaki-kun English dub? I'm dying to know! Would we ever consider going back to dub the entire series? Yes. Would we ever just dub the new season? Never. That would be a lost opportunity on our parts, and it wouldn't make much sense to dub the second and not the first, as that would be a jarring experience for a fan of the series. I certainly wouldn't like it. So, If we were to dub a show after the second season has rolled out, there's an extremely high chance that both seasons would be dubbed. How will the "Higurashi no Naku Koro ni" release be handled in terms of naming the season names? Will it go by "Higurashi When They Cry", will the second season go by "Higurashi When They Cry Kai", and will the OVA series go by "Higurashi When They Cry Rei"? It would be nice to get some insight. That's an interesting question. I find that's it's always best to stick to a name that is already known. So, we always try to do that with our titles if at all possible. While we haven't had a discussion about this with Higurashi (as we just announced it), it's more or less understood that you stick with what people know. Thanks! Is the Sentai social media guy the big dude that I've seen at Sentai's panels over the years? Do you guys have the rights for the 2nd season of Hamatora? and if not do you plan on getting the rights for it? 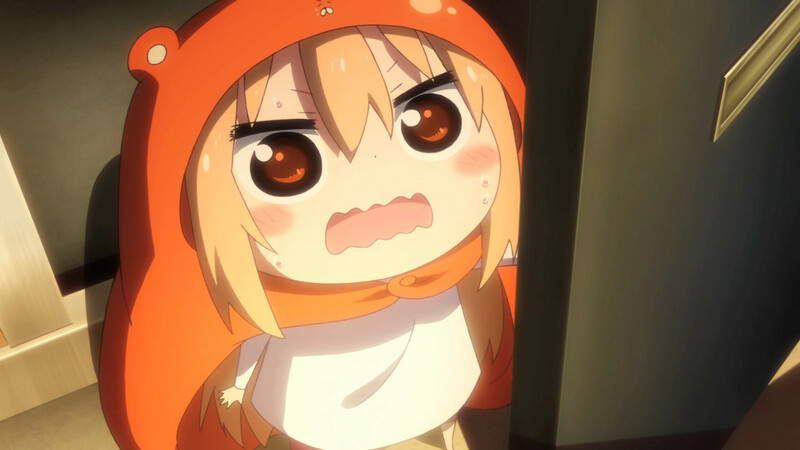 If you were an Umaru, what would your blanket look like? If you could only watch one anime for the rest of the year which would it be? Legend of the Galactic Heroes. I think 110 episodes would keep me pretty busy, and the story is JUST. THAT. GOOD. I loved your booth at AX! The music was great too! Where can I get that soundtrack from your AX booth? That's it for this week! Next time we'll talk about how to start your own School Living Club! Everything is fine, don't worry.